Two women were pistol-whipped and robbed in Chinatown early Thursday, police said. 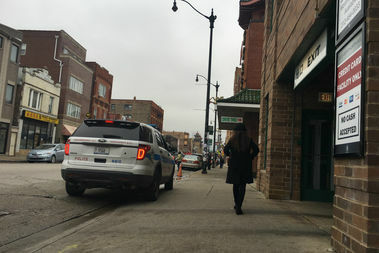 CHICAGO — Two sisters were pistol-whipped and robbed in Chinatown early Thursday in yet another violent robbery in the neighborhood, police said. "It happened so fast," one of the victims told ABC7, adding that after the beating she could "taste blood in my mouth." The victim said she and her sister had come from a flight from Midway Airport when the were attacked. The women, 26 and 31, were walking through an alley in the 2400 block of South Wentworth Avenue around 1:40 a.m. when two men got out of a silver SUV and said they were robbing the women, police said. The victim told ABC7 that both pulled out guns and ordered: "Don't move." The robbers took a wallet and purse, and the sisters said they lost several hundred dollars. "I said, 'This is all I have,'" the victim said. The robbers pistol whipped the women in their faces and then ran to a silver SUV and drove away, police said. No one was in custody. They refused medical attention, police said. The violent robbery early Thursday could be linked to a string of recent attacks in the area, including one in which a young man and woman were carjacked, police said in a community alert. Three of the incidents happened in the 2100 block of South China Place. Police have said that two to four black men are involved in the crimes. The men are described as being 20 to 30 years old, standing between 5-foot-9 and 6 feet, weighing about 180 pounds and were seen wearing ski masks. Anyone with information on the cases is asked at call area detectives at 312-747-8382.